Here’s something fun from London design consultancy BERG: a social printer that connects to a variety of online services and runs off a ticker of news and information from the world around you. 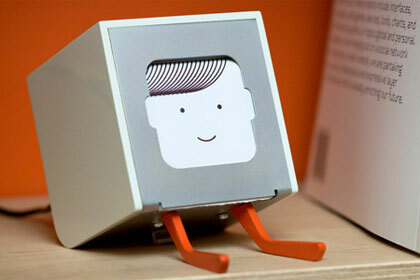 Little Printer — which was announced today, but is due to launch next year — combines an app, device and network to turn the web’s constant stream of data into something altogether more charming. Note: it’s being produced in conjunction with some commercial partners — engineering company Arup, tech companies like Foursquare and Google and brands like Nike and The Guardian — which could give it an interesting twist. When we profiled BERG earlier this year, CEO Matt Webb explained that the company was “thinking about the home, and about short-run manufacture, and about robots, and about technology used by small social groups like families. How do we visualise and design for all of this?”. Given that, Little Printer looks like evidence of that thinking moving further into the world — but the group hint that it is just the first step of a broader set of services and devices they’re working on. It’s powered by the “BERG cloud”, which they call “our technology to move the smarts of products onto the internet. We think of it as the nervous system for connected products. Built to run at scale, BERG Cloud could as easily operate the Web-enabled signage of a city block, as the playful home electronics of the future”. In a way, the project is the latest substantiation of the work on connected products that the business has been doing for the last few years. For example, it builds out of an idea they first posited five years ago of the “social letterbox”, a concept which was then expanded by their friend Tom Taylor’s web-connected thermal microprinter and later by BERG’s own work on rethinking receipts. Sure, it’s not going to be for everyone: the paper consumption alone may make some people’s eyes boggle. But I think it’s delightful.